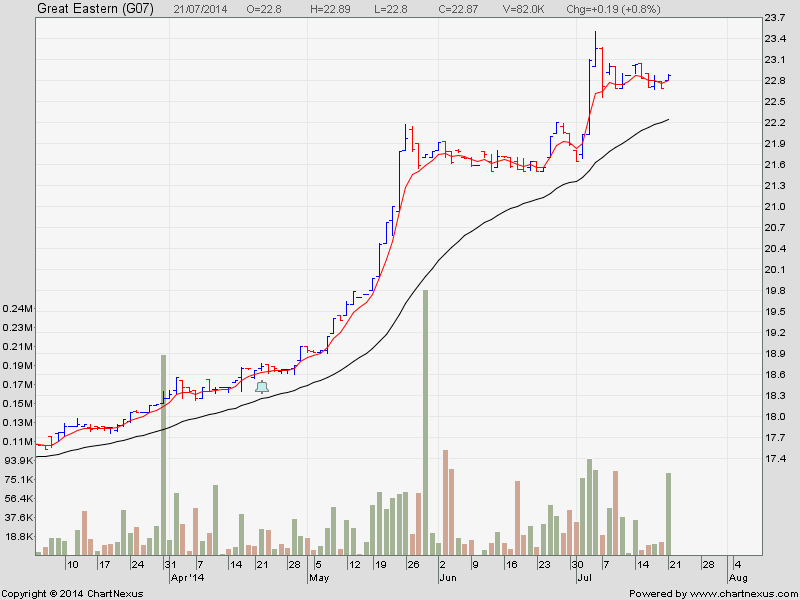 This is my company stock with great fundamental. This stock was $11.50 back in November 2011. Today its price is $22.8. Almost 100% return in 3 years. Holding this stock for long term investment is far better than holding the 3 major banks’ stock. Furthermore, there is less fluctuation with this stock. I feel GREAT today !!! Today my Great Eastern and Ezra holding flew and I exited half of my China Gaoxian at $0.054 with a handsome profit. I also received many emails from readers, thanking me for the willingness to share and posting good stock to trade on this blog. I even received from a reader wanting to buy me a good dinner because she has profited from China Gaoxian. I politely declined her offer and asked her instead to donate part of her winnings to charity or give to those poor elderly Singaporean selling tissue on the street. It will brighten up their days. My purpose of continuing this blog is to help the readers here make money to combat the ever rising inflation and to build up their retirement fund so that they can retire comfortably. And hopefully they can in turn help the needy out there. Note that for all recent posting whereby the stop buy or stop sell orders that are not triggered, you can still trade them although I didn’t mention the stock again. You can verified with me again their entry price by sending your message here . Now let’s go back to my favourite stock China Gaoxian. For those who have not entered China Gaoxian, you should kick yourself really hard because there are 2 entry signal where i posted on 24 and 29 June 2014. This may be your last chance to enter ! 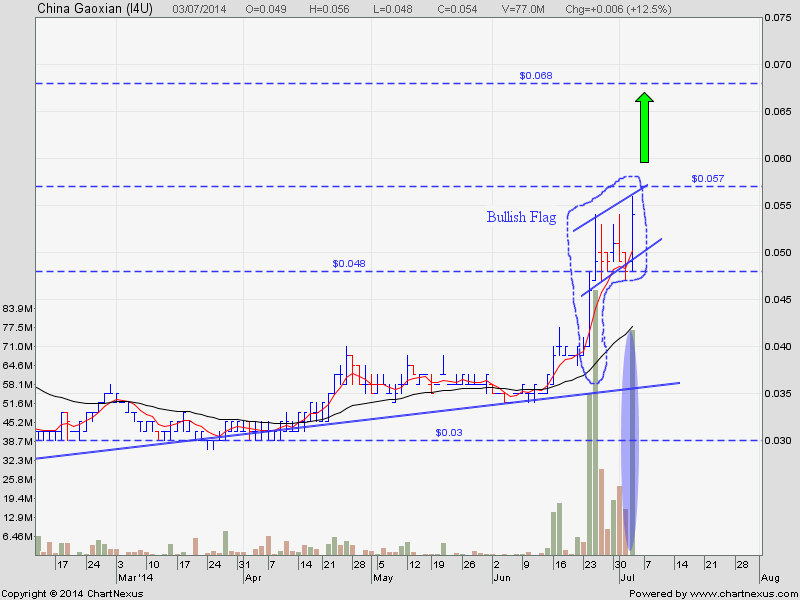 China Gaoxian had formed a Bullish Flag. 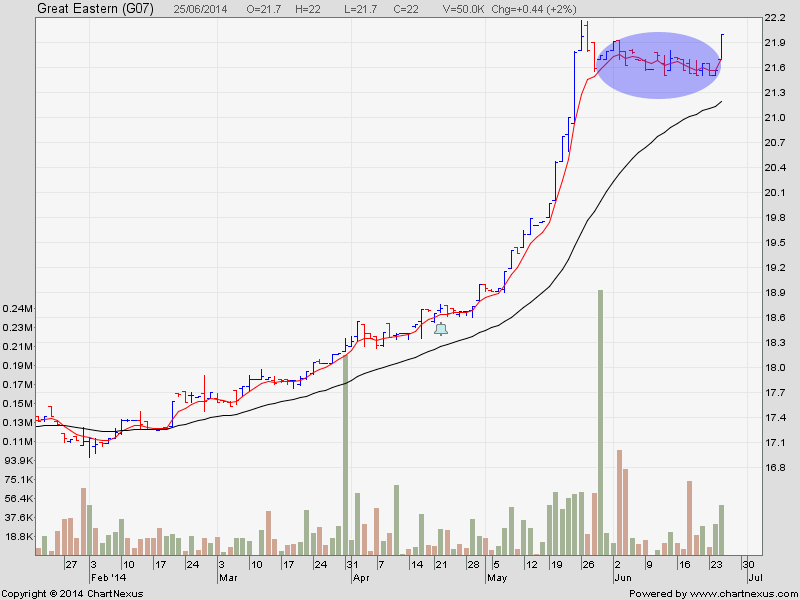 If is successfully breakout with high volume, it will reach $0.068. This is my Company’s stock. It has great fundamental and technical aspect. Today, the buying resume again after resting for 1 month. You can invest in this stock for long term. Don’t trade it because the price action is very slow.